The EK Test Center Has Been Approved By The China National Accreditation Service For Conformity Assessment (CNAS). ■ Water resistance includes differential water pressure of the unit and that of the affiliated Y-shape filter. ■ For combined units, the manufacturer does not offer general water pipes and they must be prepared and installed on site. Diameter of the pipes should comply with design standards. ■ Power distribution and wiring are subject to unit nameplates or installation guide. 1, The innovative EK air conditioner adopts the leading air-cooled heat pump design in Europe which enables an energy efficiency ratio (EER) in full load mode exceeding Chinese energy-saving product certification standard (higher than COP3.2). 2, EKAC460BR1 series air-cooled modular unit adopts R410A. Compared with the conventional refrigerant R22, R410A does not contain chlorine and therefore has no adverse impact on the ozonosphere. It serves as a medium- and long-term substitute of R22. 3, RoHS-certified environmentally-friendly zinc-plated steel boards are adopted to ensure an endurable body which is resistant against corrosion, peeling, and fading. 4, The ring-shape return air heat exchanger enables more evenly air flow and higher efficiency. 5, The electric control cabinet is covered with sheet metals both internally and externally. All internal elements are internationally renowned brand products..
6, The 500-level PMV electronic expansion valve ensures precise flow control. Degree of superheat can be precisely matched when the unit’s load changes. 7, A dual-speed condenser fan with blades passing the dynamic and static balance test is driven by a high-efficiency motor to realize efficiency and quietness at night..
8, The compressor uses internationally leading technologies, including axial end sealing technology, radial oil membrane sealing technology, and new electronic protection technology. The large oil pool and the gigantic space at the absorption side, together with the liquid-gas separation function, ensure large charging capacity. 9, The dual-system plate heat exchanger can bear up to 3.0 MPa pressure at the water side, applicable to water systems of super-high buildings. 10, The LOVATA inner grooved copper tube ensures reliable quality and high heat exchange rate. 11, The unit adopts anti-vibration design and multi-level noise reduction. The brand quiet full-hermetic scroll compressor; dual-speed quiet motor; blades passing the dynamic and static balance test ensures industry leading noise reduction grade and anti-vibration degree. 12, Lower-part hermetic structure: The lower part of the unit is covered with sheet metals to insulate noise of a running compressor. 13, An innovative smart silence mode is adopted. The fan speed (high/low gear) can be automatically adjusted based on unit’s running state and ambient temperature to allow a unit to work in quiet and low-noise mode. The noise at night is reduced by 6 dB (A). 14, The EK test center has been approved by the China National Accreditation Service for Conformity Assessment (CNAS). By national-level test (with respect to corrosion, fatigue, frequent startup, etc), the modular unit is highly reliable. 15, Defrosting conditions are automatically to save energy. Defrosting capability varies depending on the amount of frost, to maximize normal heating time and minimize temperature change caused by defrosting. 16, The EK system can be composed of up to 16 modules. Any slave module of the system can take over works of a faulty master module, posing no adverse impact on the entire system. Besides, a part of load of the EK system is born alternately to balance load of the compressor. 17, A modular unit is equivalent to two conventional modular units, saving up to 40% installation space. 18, The unit helps you save investment into water system. A modular unit is equivalent to two conventional modular units, helping you save investment into an additional set of pipelines and accessories. 19, The unit provides 13 powerful in-built protection functions, including: High-low pressure protection, inverse phase or lack-of-phase protection, frequent start protection, overcurrent protection, discharge temperature protection, overheat protection, sensor fault protection, chiller antifreeze protection, water system antifreeze protection, low water flow protection, and ambient temperature protection. 20, The unit adopts a microcomputer control system and a large LCD to facilitate operation. A single control system can control up to 16 units and monitor their running state in real time. The optional RS485 COM interface is embedded with the Modbus protocol to realize group control. 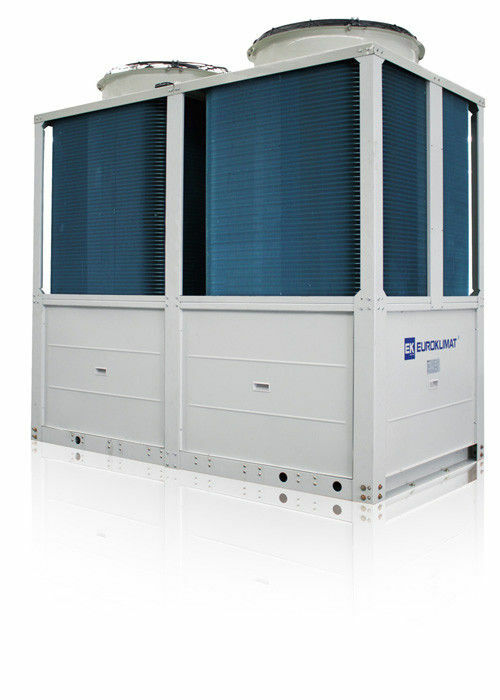 These units are applicable to places such as hotels, restaurants, recreational centers, hospitals, dining halls, offices, cinemas, factories, and supermarkets, especially to those rising high requirement on noise reduction and ambient environment and where water is lacking or cooling water tanks are inapplicable. EKAC series environmentally-friendly refrigerant-type air-cooled heat pump units combine the essence of Euroklimat accumulated over 40-year air-cooled heat pump design experience with the demand in the modular unit market of China, to fully satisfy customers requirements on efficiency, environmental friendliness, comfort, safety, and smartness to the greatest extent. These units are applicable to places such as hotels, restaurants, recreational centers, hospitals, dining halls, offices, cinemas, factories, and supermarkets, especially to those rising high requirement on noise reduction and ambient environment and where water is lacking or cooling water tanks are inapplicable. Featuring flexibility in installation, quickness in construction, and simplicity in pipelining, these units allow phase-based and moderate investment and have no requirement on the chilled water system, therefore becoming one of the best choices for users.